Franksbridge C.P. is a lively, happy, small rural school which enjoys strong support from parents and the local community. The school was first opened on 29th July 1878. Franksbridge is a small hamlet situated 6 miles from the market town of Builth Wells and 7 miles from the county town of Llandrindod Wells. 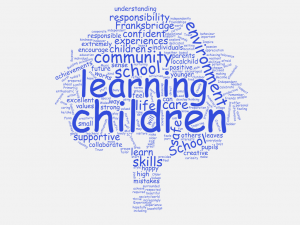 Children are taught in two classes: Class One accommodates the younger children, aged four to seven years, whilst Class Two is comprised of children aged seven to eleven. Small class sizes mean that each child receives plenty of time and attention from our experienced teachers and learning support staff. 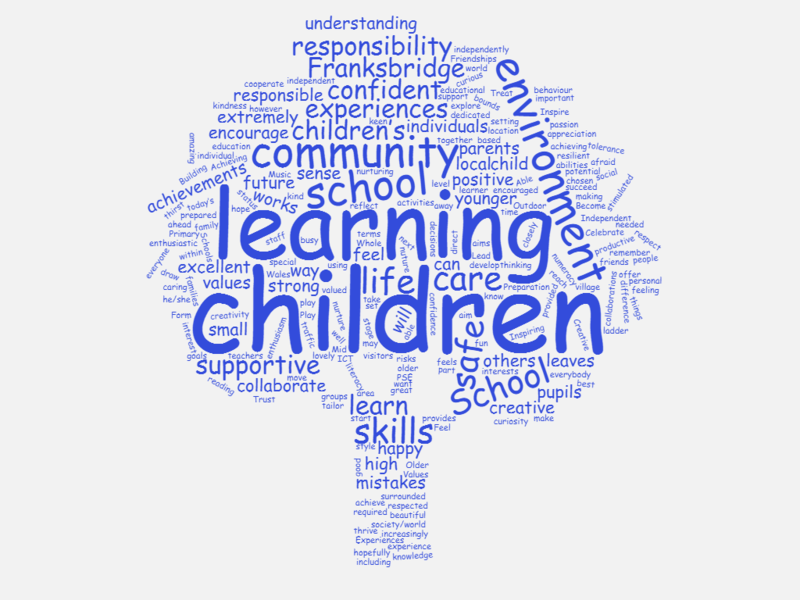 Learning is tailored to the needs of individuals, ensuring that every child is supported and challenged to fulfil their potential. In addition to the two main classrooms, we have a third multi-purpose classroom, well stocked fiction and non-fiction libraries, and a computer suite. Delicious dinners are cooked on site by Mrs. Groves. Franksbridge Community School stands in exceptional grounds comprising a large play ground, games field, community play area, school vegetable garden, pavilion, nature reserve, a quiet garden, muddy kitchen and a copse. Our children spend a great deal of time learning and playing outdoors. We are a pioneer school for ‘Powys Playful Schools’: the children of Franksbridge School enjoy having the freedom and resources to climb trees, practise gymnastics, dress up, enjoy role play and make dens at play times, as well as taking part in a wide range of sports and games. We are also a ‘Lead Creative School’ committed to bringing excitement, fun and creativity into learning and teaching. Our most recent project involved working with storytellers, Daniel Morden, Phil Okwedy and Bethan Mascarenhas. Our children enjoy whetting their storytelling tools and developing their ‘Positive Habits of Mind’. All learners at Franksbridge School (children and adults) are committed to developing ‘Growth Mindset’: we take opportunities to explore ideas, methods and possibilities in an open, creative way. We expect to make mistakes along our learning journeys but rather than fearing mistakes, we embrace them as important parts of our learning experiences. The children of Franksbridge benefit from a wide range of opportunities offered by members of our local community and our wider school community. Franksbridge School is extremely grateful to all our volunteers and partners for enriching the lives of our pupils and, in doing so, strengthening our special community. It is a wonderful example of the high standards that can be achieved by small, rural schools and the symbiotic relationships enjoyed by small schools and their communities. The strong levels of collaboration and positive interaction amongst pupils of all ages are exceptional. The school provides an excellent variety of opportunities for pupils to develop their social, emotional and creative skills. The school’s arrangements for the wellbeing, social and cultural development of all pupils are outstanding. An excellent variety of opportunities help pupils to develop their social, emotional and creative skills to a very high standard. Nearly all pupils are aware of the school’s values and learning habits of respect, self-discipline, collaboration and perseverance. Staff reinforce these values exceptionally well and pupils apply them consistently in their daily lives. There are opportunities for very practical and active outdoor learning. Pupils have regular opportunities to be active, to climb and sit in trees and to explore, balance and swing on apparatus in the adventure playground. As a result, they are very active and inquisitive learners. Children and adults demonstrate high levels of respect towards each other in classes and on the playground. Nearly all produce highly creative work and their oracy skills are outstanding.